In 2013, the World Challenge Championship kicked off its twenty-fourth consecutive season at St. Petersburg, Florida in March as a support event for the IndyCar series. The season ended the first weekend in October at the Grand Prix of Houston. In between these two events, there were races at Long Beach, Circuit of Americas, Detroit, Lime Rock, Toronto, Mid-Ohio and Sonoma Raceway. Grand Touring (GT) – This group included the series quickest cars: Porsche 911 GT3, Chevrolet Corvette, Dodge Viper, Cadillac CTS-V.R, Nissan GTR, Audi R8 LMS and Volvo S60. The preparation rules remained unchanged from the previous year. These vehicles produced more than 450-horsepower. Grand Touring Sport (GTS) – The cars in this class are not permitted the same level of preparation as the GT category. The class is a mix of cars that would be best described as sports cars or sports sedans. 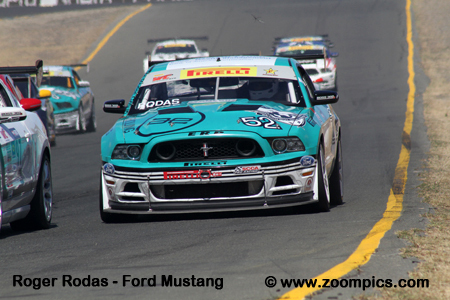 Vehicles eligible to compete in GTS include SCCA Club Racing Touring 2 cars and some FIA GT4 cars. Makes competing in this category include the Ford Mustang, Porsche Cayman S, Chevrolet Camaro, Kia Optima and Acura TSX. Touring Car (TC) – The preparation of the Touring Cars was closely aligned with Grand Am Cup and the Sports Car Club of America’s Improved Touring classes. The wide range of vehicles homologated for this category meant that power output ranged from 180 to 260-horsepower. Also, there was significant variation in drivetrain configurations – front-wheel, rear-wheel and all-wheel drive. Makes competing in the category included the Honda Civic Si, MAZDASPEED3, Volkswagen Jetta and Golf. 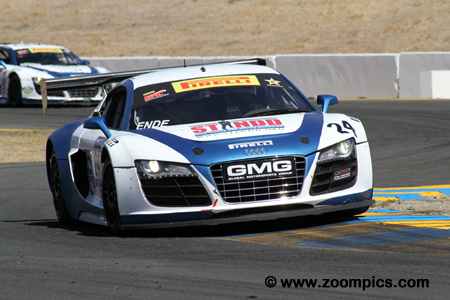 Round thirteen for the GT categories was held at Sonoma Raceway’s twelve turn road course and would mark the season’s penultimate race weekend. The short-lived GT Podium. 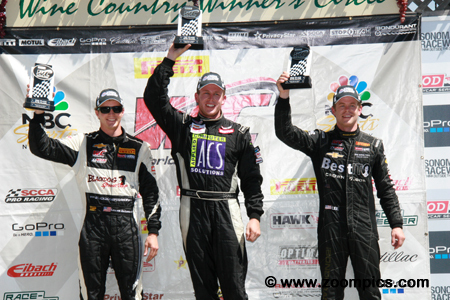 In the center is race winner Andy Pilgrim driver of the factory entered Cadillac CTS-V.R. To Pilgrim’s left is second place finisher Mike Skeen. However, Skeen ignored a drive-through penalty for contact with James Sofronas on lap-1. Officials stopped scoring him after lap-18 and he was classified eleventh. Completing the podium is Duncan Ende who started last in the GT class. Andy Pilgrim qualified second to his teammate Johnny O’Connell. 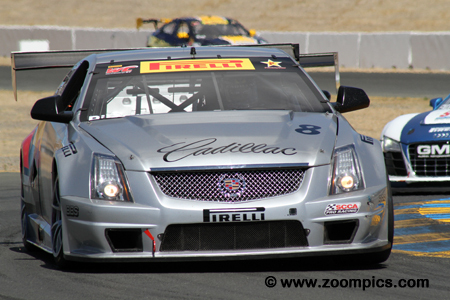 The driver of the Cadillac Racing Cadillac CTS-V.R struggled with the car during practice but changes made by the team improved the performance for qualifying. At the start, he slotted into second behind Randy Pobst but the two made contact in corner two on the first lap and Pilgrim moved out front. He would lead the remainder of the race and score his first win of the season. GT point’s leader, Johnny O’Connell qualified on the pole. O’Connell lost a lot of positions at the start when he stalled the car. He got the Cadillac going again but at corner five O’Connell tangled with Peter Cunningham and Jack Baldwin. 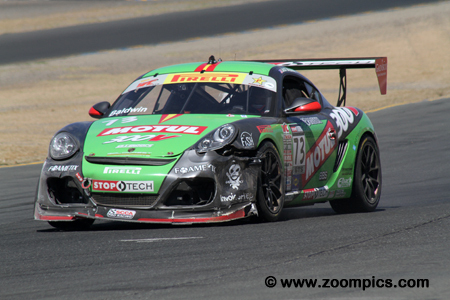 The damage to his car was extensive - O’Connell returned to the race after a pit stop and finished twelfth in GT. Jack Baldwin’s performance mirrored that of O’Connell. 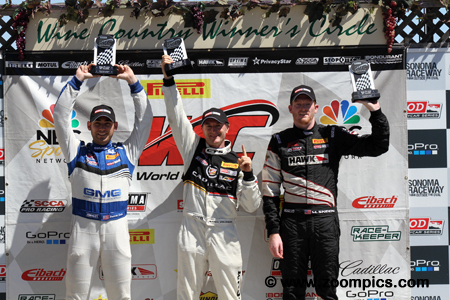 Baldwin led the GTS points and would start from the class pole in Saturday’s event. He dropped down the race order at the beginning of the event when he was caught behind the stalled Cadillac. Then at corner five Baldwin was involved in an incident with Johnny O’Connell and Peter Cunningham. The damage to Baldwin’s Porsche forced him to retire, resulting in his first DNF of the season. 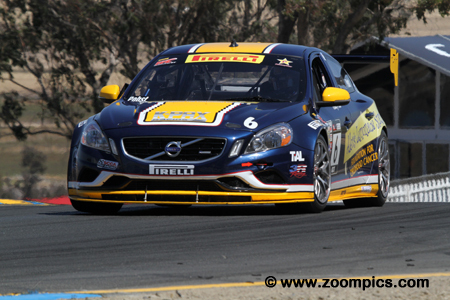 Starting third in the GT category was the K-PAX Racing Volvo S60 of past series champion Randy Pobst. Pobst was able to capitalize on O’Connell’s misfortune and grab the lead into the first turn but it was short lived. As Pobst went into corner two, he and Andy Pilgrim made contact causing him to spin. Pobst got going again and was fourth at the checkered flag. 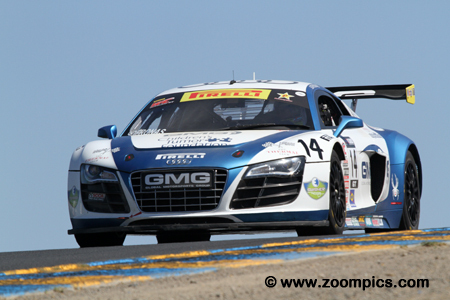 This was Brandon Davis’ second GTS start of the season; his first GTS race was at Long Beach where he finished fourth. 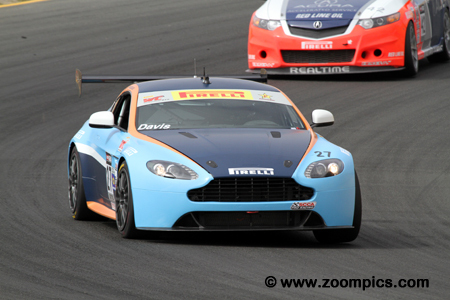 At Sonoma, he qualified the Barracuda Networks Aston Martin Vantage GT4 second in GTS. In the mayhem at the start, Davis got away second in GTS. He followed Andy Lee but the two drivers would exchange the lead throughout the contest – in end, Davis led eighteen of twenty-six laps and took the victory. Racing the No. 10 Black Dog Speed Shop Chevrolet Camaro was former series champion Lawson Aschenbach. 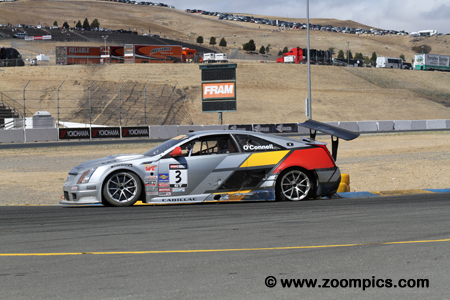 At Sonoma Aschenbach qualified third in the GTS class. Despite multiple position changes during the race, he remained in third and grabbed the final spot on the podium. With one event left in the 2013 season, Aschenbach was still third in the GTS driver standings but closed the gap on Jack Baldwin and Mark Wilkins. Duncan Ende suffered through a series of problems on Friday and started last in the thirteen GT car field. By race time it appeared that Ende’s issues were behind him as he found himself dicing for third place with his teammate James Sofronas. At the checkered flag, he was third but after Mike Skeen was penalized for ignoring the black flag he was classified second – this was his first podium of the season. 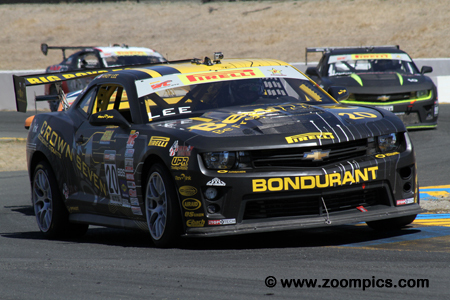 Heading into the Sonoma event, James Sofronas trailed Johnny O’Connell by 13-points for the driver’s title - consistency had kept Sofronas in the hunt. For round thirteen he would start from the fourth grid position. In the race, Sofronas found himself battling his teammate Duncan Ende for third. Unable to pass Ende he finished fourth on the track but was promoted to third after Mike Skeen’s penalty and left Sonoma with the points lead. Andy Lee drove the No. 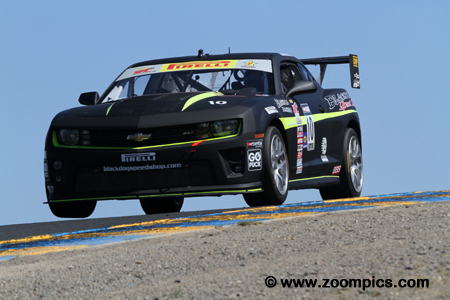 20 Best IT/Bondurant Chevrolet Camaro and qualified fifth in GTS. Lee made a terrific start and led the first lap, soon he was challenged by the second fastest qualifier Brandon Davis. On lap-4 Davis took the lead but was repassed by Lee at corner seven on lap-14. Davis made the final pass for the lead on lap-19 – Lee would hold his position and finish second in the GTS category. 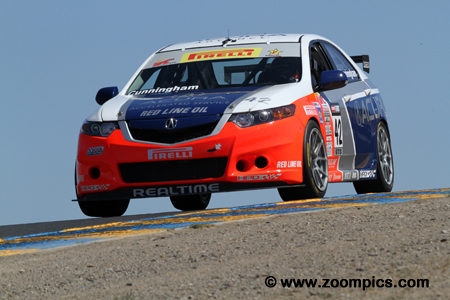 Realtime entered two Acura TSXs – one for team principal Peter Cunningham and another for his teammate Nick Esayian. Cunningham, a multi-time World Champion, would start from the sixth GTS grid position. He was having a difficult season but was coming off two runner-up finishes at Mid-Ohio. Cunningham’s luck would change again as he was involved in the incident with O’Connell and Baldwin. With his car badly damaged he finished twenty-second. The GTS podium and in the center is Brandon Davis who earned The Racers Group their first victory with the new Aston Martin Vantage GT4. To his right is Andy Lee who finished a well-earned second after a race-long battle with Davis. The last spot on the podium belongs to Lawson Aschenbach.